During the workshop, we will investigate the concepts and the design techniques for the development of a coherent design methodology which challenge the traditional perception of the object by raising an open framework for thinking about design as a way of accumulation of different possibilities. We will explore how the design intentions and strategies can be embedded deeply in the formation of design, through a set of local interactions, geometrical systems and surfaces. The participants will explore the creative potential of the emerging and dynamic phenomena through the use of a series of algorithmic strategies (Grasshopper + plug-ins) for interactive simulation and design optimization. Having the opportunity to experiment with a range of computational tools we will design and fabricate a small pavilion focusing on the properties of aluminum profiles and Etalbond composite material to demonstrate in an artistic way the construction logic of a sustainable and energy saving facade system. 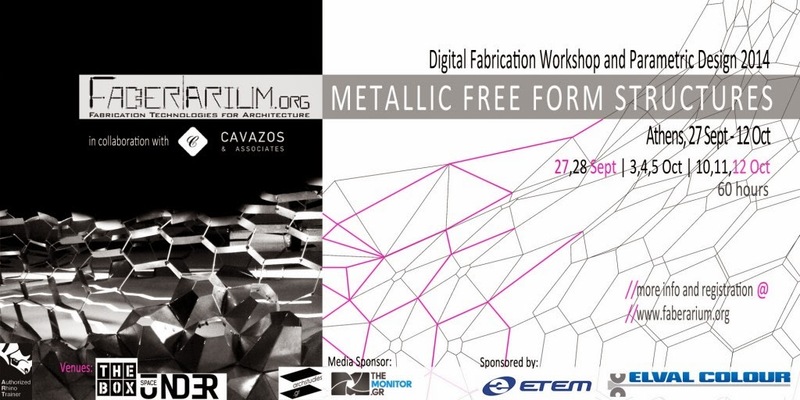 The goal of the workshop is to combine technological precision and creativity and connect the architects with the local industries and companies which provide the material and machinery. The contemporary digital fabrication techniques and the case of CNC (computer numerical control) machines, provide effective connection between design and production and enable the construction of projects into scale 1:1.